What I've noticed this season on Glee is that my favorite characters are shifting a bit. It makes me a bit angry, usually, but I decided to just compartmentalize that and instead make a graph out of it! 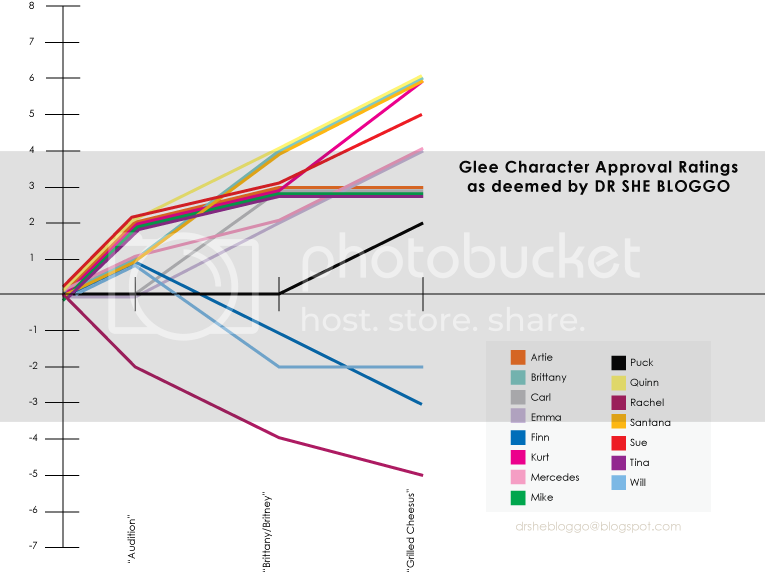 Behold, the Glee Character Approval Ratings, as detailed by DR SHE BLOGGO. Now, I'm not a scientist. My value system is entirely subjective, and the graph is best looked at in the big picture. But look, in the first three episodes: Quinn, Brittany, Santana, and Kurt are on their way up! Rachel, Will, and Finn are tanking. Everyone else is somewhere in the middle, waiting to break out. Agree? Disagree? I hope to get a new graph up every few episodes to chart the characters. For the record, I judge using mostly character continuity and likeability, but also a little bit with the songs and how the character is portrayed.